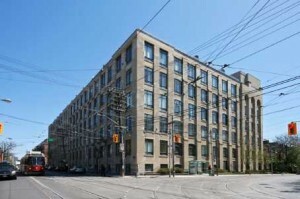 Premier Candy Factory Lofts! Large Sunny South West Corner Rarely Offered W/ 8 Huge Arched Windows & Unobstructed Views. Luxurious Custom Suite Completely Renovated & Featured In The Globe & Mail. New Kitchen By Award Winning Design Team! Historic Wooden Beams, Metal Elevator Doors & Exposed Brick. Owned Undground Parking. Designer Bathrooms. Sure To Love This Suite In The Most Iconic Loft Building In Toronto. 2 bedrooms + den, 2 bathrooms, with 1 parking space.